This Memorandum was submitted by "Wassa Effendi, an Albanian Catholic, who has been for some time Mustechar of the Vilayet of Kossowo" to A. H. Layard of the British Legation in Constantinople on 18 March 1878. It was transmitted to Disraeli's foreign secretary, the Earl of Derby, on 29 March 1878, as a reaction to the Treaty of San Stefano. This Treaty, signed between Russia and the Ottoman Empire on 3 March 1878 at the end of the Russo-Turkish war of 1877-1878, recognized Bulgaria as an independent State. The proposed borders for Bulgaria, against which the author protests, were originally to extend far to the west beyond Skopje, Ohrid and Korça, including much Albanian-speaking territory, and down to the Aegean. Elsewhere, under the said treaty, Montenegro almost doubled its territory, Serbia annexed Nish and Leskovac, and Romania was recognized as independent. Although the Bulgarian borders were subsequently revised under the Treaty of Berlin in July 1878, the Albanians themselves gained nothing and were under threat from all sides. 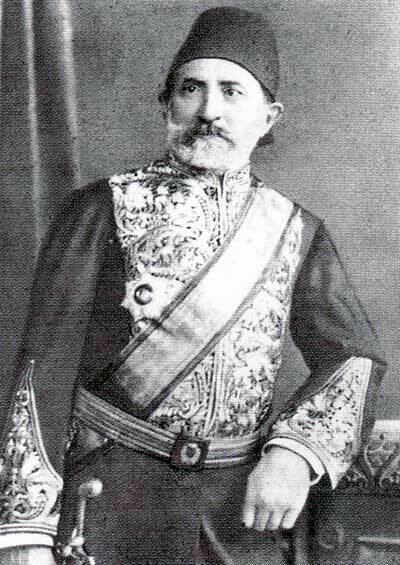 Wassa Effendi, known in Albania as Pashko Vasa (1825-1892), was a political figure, poet, novelist and patriot from Shkodra who played a key role in the rise of the Albanian nationalist movement. In the autumn of 1877, he was a founding member of the Central Committee for the Defense of the Rights of the Albanian People in Istanbul. 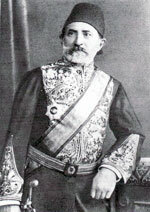 Through his contacts there, he also participated in the organization of the League of Prizren in 1878. At the same time, he served the Sublime Porte in various positions of authority, and ended his day as Governor General of the Lebanon. The victory would seem to have left the last word to Russia, and in the final analysis, this fatal term has no other significance or aim than to seek the destruction of Turkish rule in Europe. By giving to the new Bulgarian State an extension of its territory from the banks of the Danube to the Aegean Sea, and from the banks of the Black Sea to the Albanian border, Russia has cut European Turkey into two and seized the torso - including the heart and intestines - of this mutilated body, leaving the Ottoman Government with only the head and feet. It is obvious that under such conditions, a continuation of Ottoman rule in Europe is impossible and would be a waste of time to argue the contrary with borrowed arguments. But what must be urgently understood in this issue is that Russia, having gained the upper hand with its victory, does not seem willing to take into account the history or ethnic structures of the countries which, with a dash of the quill, if not to say a slash of the sword, it intends to annex to the new State it has created for the Slavs, under the name of Bulgaria. Genuine Bulgaria, despite the vagueness of its significance, should not be made to expand beyond the Balkan mountains. Even if we acknowledge Russia's will to bring together the pockets of Bulgarian population here and there in the Balkans and have them benefit from its victories, it is still not rationally possible to accept that the Muslim, Albanian, Greek or Kutzovlach populations, in the areas where they are in the majority or on equal footing, should be considered Bulgarians and be encompassed within the new State which Russia proposes to create. Thrace was not and is not Bulgarian; nor is Thessaly; and even though there are areas in Macedonia inhabited by Bulgarians, it would still seem to me rationally and historically unacceptable for Macedonia to constitute part of Bulgarian territory. As to Epirus and Albania, it is obvious that there is not an inch of that territory which could even be considered. The ethnic makeup, the language, customs, in fact, everything protests against Russian claims and the new doctrines of Panslavism. The district of Ipek (Peja) which is considered to be part of Old Serbia, is Albanian through and through. The population is composed for the most part of Albanian Muslims. There are but a few villages of Slavs, and these are colonists. Gjakova is inhabited by Muslim and Catholic Albanians. There are only about thirty Slav families there. The same can be said of Prizren where the vast majority of the population is Albanian - Muslim and Catholic. Kosova itself is inhabited by a majority of Albanians. Prishtina, the capital of the vilayet of this name, has 1,200 Muslim families and only 350 Serb families. Most of the villages spread across the huge plain of Kosova are inhabited by Albanians - who own the land - whereas most of the Slav inhabitants arrived there as colonists. Generally speaking, there are very few villages where the majority of the population is not Albanian. The same can be said of the districts of Gjilan, Kurshumlia and Urkub (Prokupie). It is true that in Leskovc, Vrania, Kustendil, Palanka, Kumanova, Ishtib and Karatova there are compact settlements of Bulgarians, but there are also substantial groups of Muslims of Turkish and Albanian ethnicity. The district of Kaçanik is entirely Albanian. The town and district of Kalkandelen (Tetova) are also inhabited by a large majority of Albanian Muslims. Christians of Slavic ethnicity are but a minority there. The town of Uskup (Skopje) and the mountain districts are also inhabited by a great majority of Muslims and Albanians. There are only Bulgarians in the villages on the plain where they came en masse to cultivate the land as simple colonists for large Muslim landowners. The districts of the two Dibras - upper and lower - including the districts of Mat and Kërçova (Kicevo), are without any doubt entirely Albanian. It is true that there are a certain number of Slav Christians, farm labourers and workers, but they are a small minority. The proof of this is that the Muslims of these districts, who are all Albanians, would able to muster an army of 20,000 men or more. At Ohrid there is a Bulgarian population devoted to farming and trade, but the Muslims, the Kutzovlachs and Greeks, when taken together, form the majority of the population, the major component of which are the Albanians. The other groups, who have become Albanian speakers, have nothing in common with the Bulgarian Slavs. The same logic can be applied to the town and district of Monastir (Bitola) which are inhabited by Muslims - Turkish and Albanian -, by Bulgarians and by a large majority of Albanian Vlachs and Greeks. It must not be forgotten that the Muslims and all the Albanians have always intensely disliked farming. To make use of their farmland and make it productive, they always invited Bulgarians as colonists, and the advantageous position they latter were given, caused them to settle in various parts of Thrace, Macedonia, Thessaly and even in High Albania. To allege from this historical fact that most of European Turkey has been bulgarised or slavised shows more than a lack of respect for the most elementary principles of justice and equality. Despite the fact that the Bulgarians have settled in several parts of Macedonia, Thrace and Thessaly, there is still no plausible reason to regard these reaches as part of Bulgaria. It would be more just and equitable, and more rational, to withdraw the Bulgarian colonies back to regions which are truly Bulgarian beyond the Balkan mountains rather than to expel the original inhabitants who in all cases constitute the force of the country and own the property and wealth. I have stated that by giving to the new Bulgarian State such a vast stretch of land from the Danube to the Aegean Sea, they are depriving European Turkey of the most vital part of its territory, leaving it with two trunks separated from one another. As a result, it will be impossible for the Ottoman Government to govern the provinces which Russia has agreed to leave it. With Bulgaria separating the provinces from the capital city, how can one imagine that Epirus, Albania, Bosnia and Herzegovina could be administered and protected? Russia has declared that it went to war to improve the lot of the Christians and to put a swift end to all the problems which the Eastern Question was causing to Europe. If its aim was really as noble and unbiased as it claimed, it should have considered that by extending the borders of the new Bulgaria into the heart of Albania and right down to Aegean Sea, it was doing nothing other than planting the seeds for a more disastrous and horrifying war than the one we have just experienced. The Albanians will never suffer Bulgarian encroachments on their territory without taking umbrage to them in their national interests and pride, and we know well that the Greeks are no friends of the Slavs. It is therefore certain that, in the not too distant future, the Albanians and Greeks will join in a common scheme and desire - joint vengeance - and as allies will attack the Bulgarians who, not being a warrior race, will, despite their militias, be unable to withstand the shock of such an assault of these two peoples allied in common interests. To bring matters to a head, and there is no doubt that this will soon happen, Russia must intervene either by occupying the country militarily for an indefinite period of time, or by undertaking some other military expedition to defend the Bulgarians, and bring about the total ruin of the Ottoman Empire, destroying all the other peoples in European Turkey to the profit of the Slavs. In the face of such a scenario, what gain can there be from peace, tranquillity, an improvement in the lot of the Christians and European security and interests? All of Europe will find itself in a maelstrom of terrible consequences through Russian moves if the Powers do not intervene to modify the appalling conditions imposed upon Turkey by the Government of the Czar. England and Austria-Hungary, more than any other countries, must come to accept the fatal necessity and not allow these changes and the attendant grave complications arising today to explode later to the jeopardy of general peace and, what is more, to the detriment of the balance of power in Europe.